Rome is one of the most popular tourist cities in the world for a reason. There are things to do in Rome for everyone from the Colosseum to a cat sanctuary located in the ruins where Julius Caesar met his demise. Rome is widely considered the birthplace of Western civilization (although it does have to compete with ancient Greece for that title) and today is one of the most visited cities in the world. With a history spanning 28 centuries it is virtually impossible to walk anywhere in Rome without bumping into ancient buildings or a courtyard filled with relics of past centuries. The entire historic center of the city is a UNESCO World Heritage Site so there is an incredible amount to see in a relatively small area, making it a great destination no matter how long you have to explore. 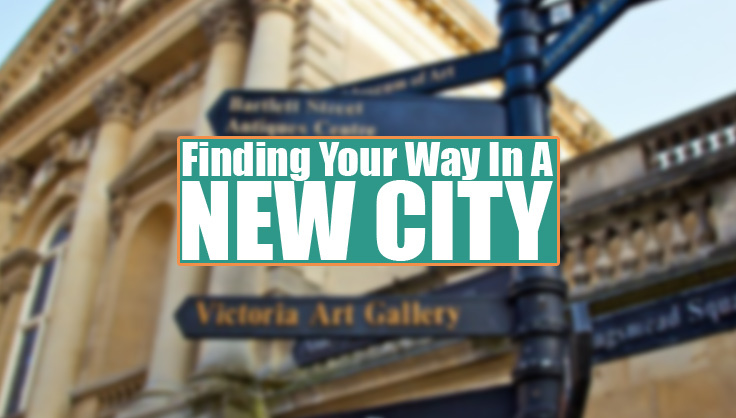 Here are a few of our suggestions for planning your visit. The Colosseum is the top attraction in Rome for a reason. This ancient structure rivals our modern day arenas in size and a good portion of the building is preserved as opposed to many where just a few pillars still remain. You can easily imagine the labyrinthine underground passageways filled with wild animals and gladiators or even the entire arena flooded to recreate full-scale naval battles. 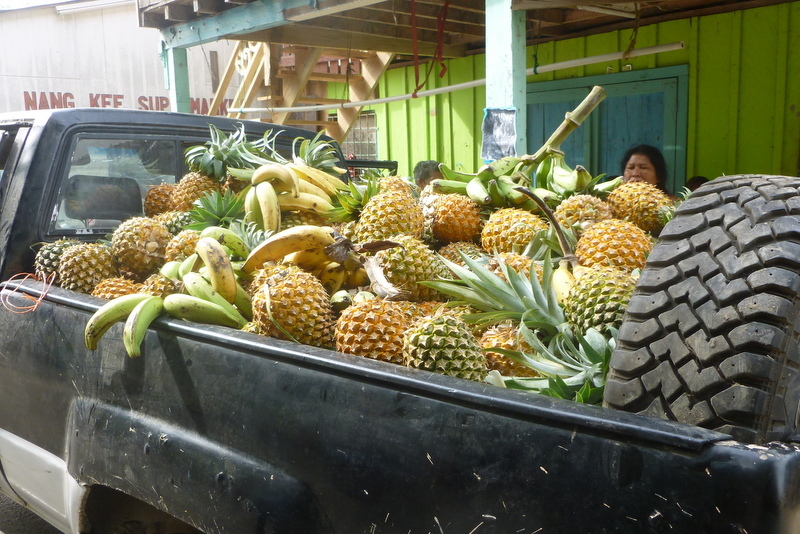 I highly recommend a guided tour. When you leave, don’t miss the Arco di Constantine (Arch of Constantine) just outside. Then move on to stroll through the nearby Roman Forum & Palatine Hill. 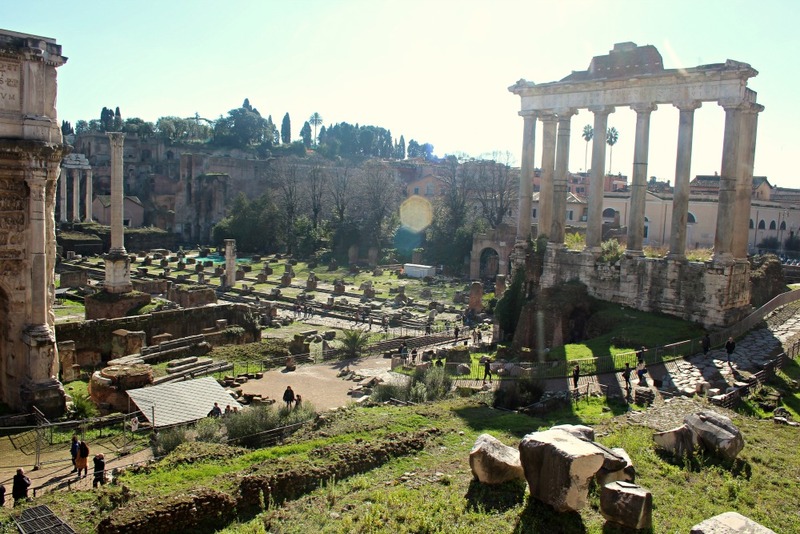 The Roman Forum, located basically “next door,” is what remains of a plaza that was once the center of activity in ancient Rome, surrounded by government buildings and temples. Today this huge excavated area shows the scope of what underlies the modern city of Rome. Situated conspicuously in the very heart of the modern city, this expansive field is filled with bits and pieces of ancient architecture from loose stones, to complete porticos and intricately carved arches. 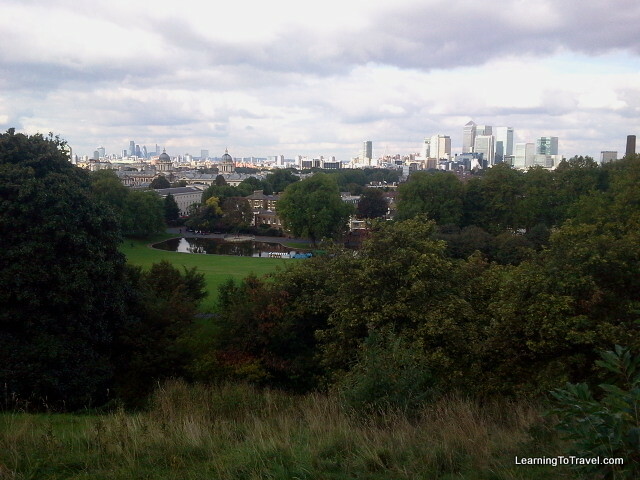 There are even buildings in the area where you can see the modern layers built directly on top of ancient foundations. If you still have time, or maybe a second day, I recommend a visit to the Basilica di San Clemente. This Catholic church, like so many things in Rome, is built on top of older structures. In this case, the church is built on the site of a Pagan Temple and a Roman house with all three layers visible so it’s like stepping back in time – way back in time – as you descend the stairs. If you’re coming directly from the Colosseum, you’ll pass the Ludus Magnus on the way to San Clemente. These ruins of a gladiator arena are free to visit and worth a quick walkthrough. If you are ready for lunch, or more likely dinner by this point, we highly recommend i Clementini. Located just across the street from the Basilica di San Clemente, this small restaurant has deliciously simple, authentically Italian and specifically Roman fare. Also just a five-minute walk from the Colosseum is the Basilica di San Pietro in Vincoli or the Church of St. Peters in Chains. 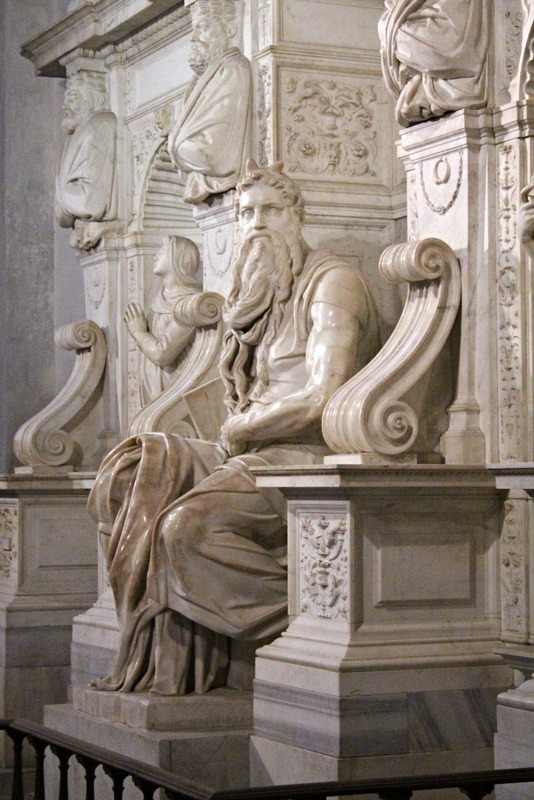 In addition to displaying the chains St. Peter is said to have been shackled with when imprisoned in Jerusalem, this church is also home to Michelangelo’s statue of Moses. Entrance to the church is free, although if you’d like to have a light shone on the stature for a better look, it will cost you a euro. This is pretty common when viewing some of the more famous works located in the plentiful churches in Italy. 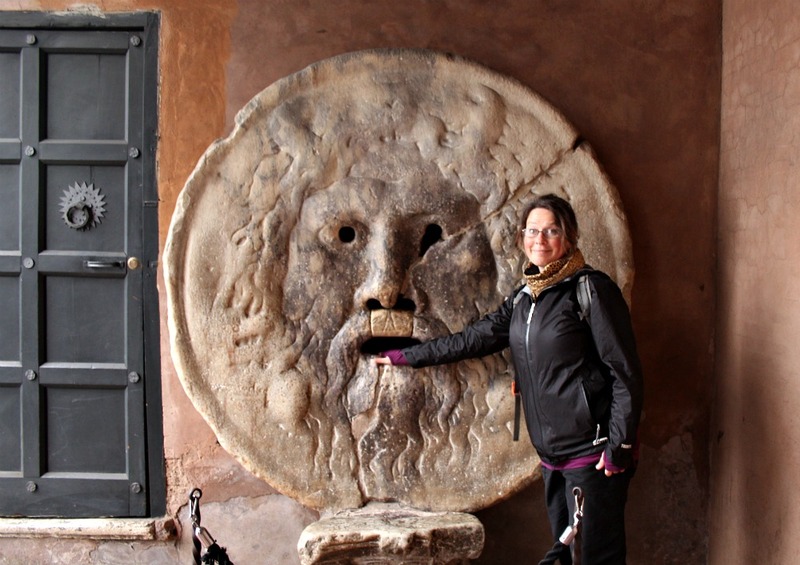 If you still have time, although at this point that seems unlikely, visiting the Bocca della Verita, or The Mouth of Truth is a fun diversion. Although no one’s quite sure what the original purpose of this huge carved marble mask was, the legend is that if you put your hand in its mouth and tell a lie, it will slam shut and bite your hand off. Thousands of tourists line up every year to try it out and I’ve never heard of anyone losing a hand on their Italian vacation, so it’s probably pretty safe, but I’ll let you decide if you’re willing to take the risk. 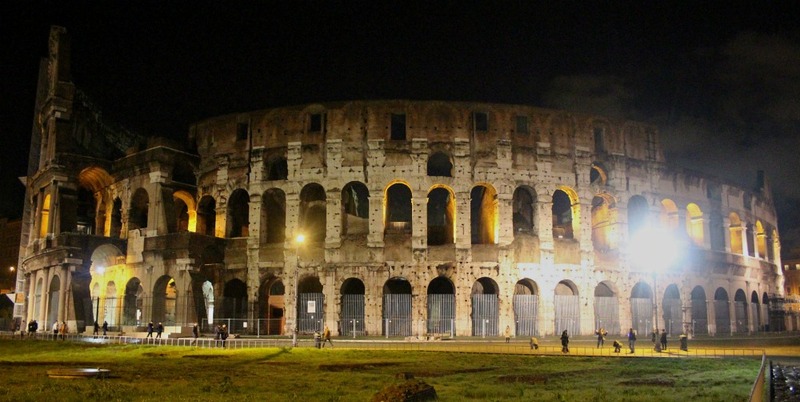 Before heading back to your hotel, I recommend taking another walk by the Colosseum so see it lit up at night. 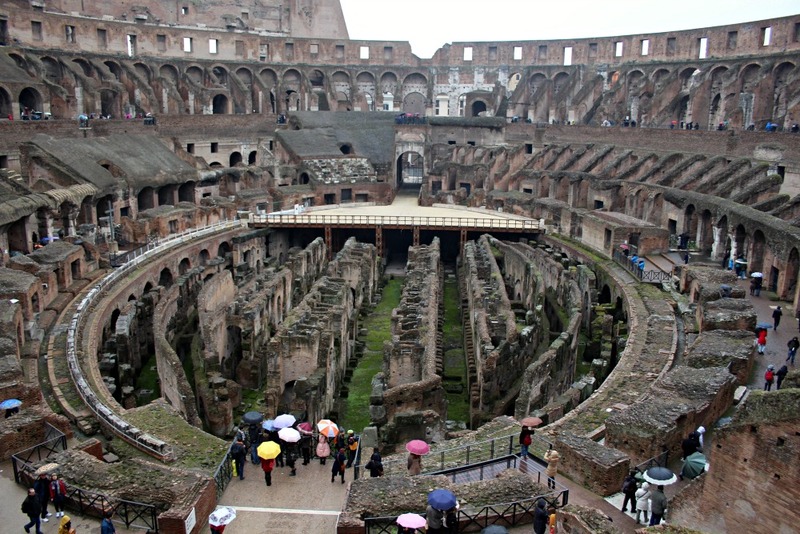 A bit to the west of the Colosseum area is another cluster of must-sees. 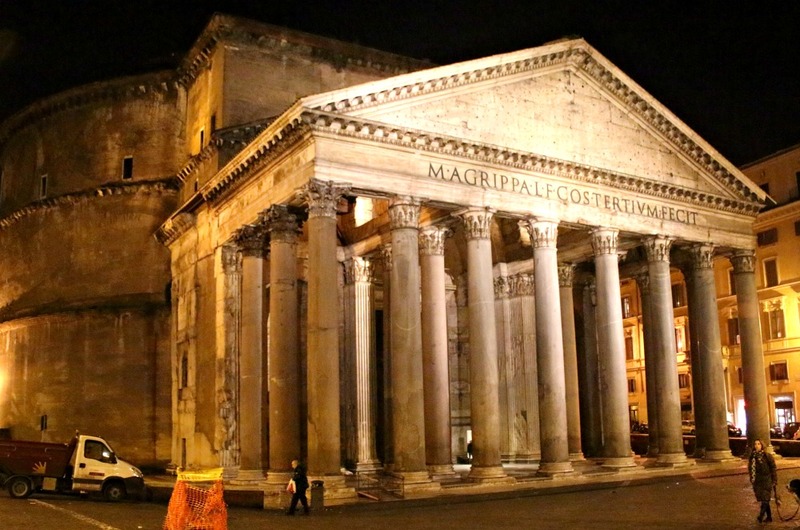 The Pantheon was originally built as a temple and dedicated nearly 2000 years ago. Because it has been in nearly continuous use ever since, it is incredibly well-preserved for its age with polished marble floors (a 19th C reproduction of the original), well-maintained statues in roofed niches and numerous granite columns. The footprint is distinctive, with a circular main chamber connected to a rectangular porch held up by Corinthian columns. The roof on the main chamber is a concrete dome (the largest unreinforced concrete dome in the world) with a central opening to the sky which provides the main light source for the building and allows rain and snow free access (the floor slopes gently to drain any precipitation that does manage to make it in). Although unique at the time, the architectural style became classic for the period and has been used in some well-known modern structures like the Jefferson Memorial in Washington D.C. 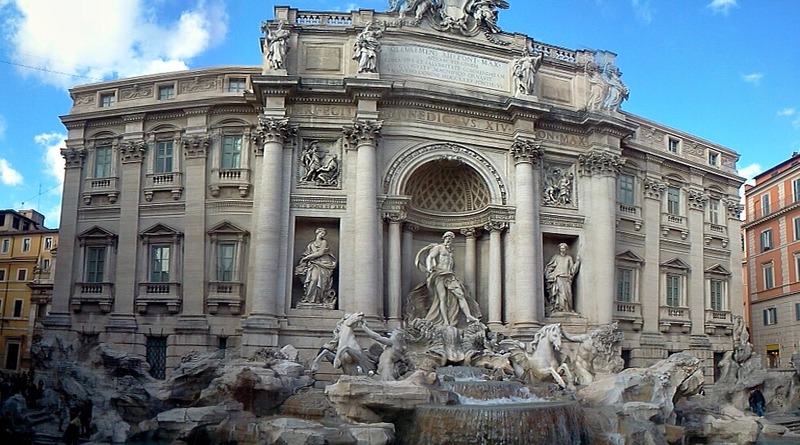 Nearby, the Trevi Fountain marks the location of the terminus of one of the aqueducts that provided water to ancient Rome and is one of the most iconic fountains in the world. At over 160 feet wide and 86 feet tall, this fountain depicts, Oceanus, God of the Sea being pulled in his chariot by two seahorses led by tritons. This is a serious piece of art and architecture that is worth seeing in the daytime and again lit up at night if you have the time. 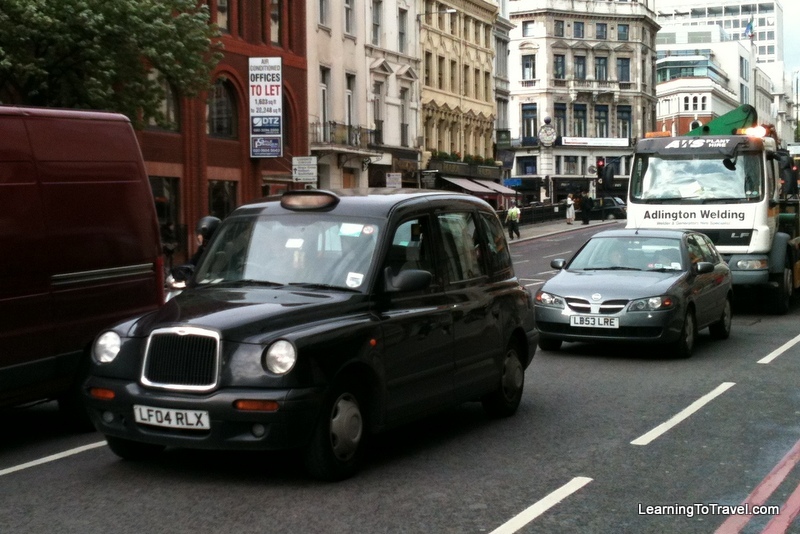 It’s also one of the most popular sites in the city, so expect a crowd, but it is considerably less crowded at night. One of my favorite and unexpected stops in this part of Rome is the Torre Argentina Cat Sanctuary. 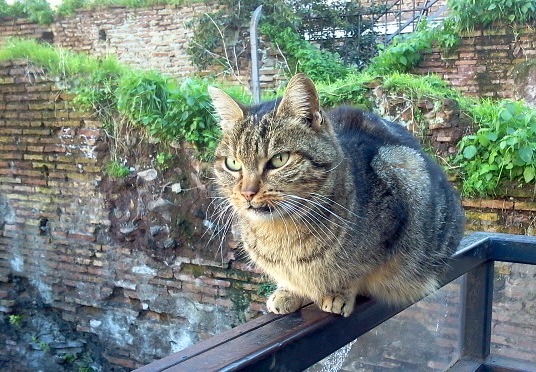 Located in the Largo di Torre Argentina ruins, this largely volunteer-run no-kill cat shelter is home to over 100 cats. Excavated in the late 1920s this sunken courtyard was quickly colonized by homeless cats fed by a succession of cat ladies. Because of the archaeological and historical significance of the area, (these ruins include the Theatre of Pompey where Julius Caesar was murdered in 44BC) it became a tourist attraction, inadvertently also making it a perfect location for a cat shelter. Funded largely by tourist donations, the sanctuary not only houses homeless kitties, friendly and feral, but spay and neuter thousands of cats every year. If you like cats at all you should definitely stop in and make some new furry friends. I fell in love with a blind black kitten with a crooked tail that I really wanted to bring home. Instead, I bought some things at the gift shop and got a job at a cat rescue when we returned home. A short walk away from the Cat Sanctuary, just on the other side of the River Tiber, is the funky and bohemian neighborhood of Trastevere. This working class, traditional neighborhood is known for budget hotels, brew pubs and espresso bars and we found it to be a great place to wander and soak up everyday life in Rome. I highly recommend the walking tour available thru Rick Steves free Audio Europe app. Make sure to stop for an espresso and drink it Italian-style – quickly while standing at the counter. Italy serves coffee small, strong and fast. Espresso isn’t a luxury here, it’s a staple – it’s also a sacred ritual, a chance to pause for just a moment in a busy day. Generally, we found that a shot of espresso cost only one euro, making it accessible to all, unlike a $4 latte at Starbucks. Don’t look for any 20oz lattes here and don’t expect to hang out for hours using free wifi – those are not things here. 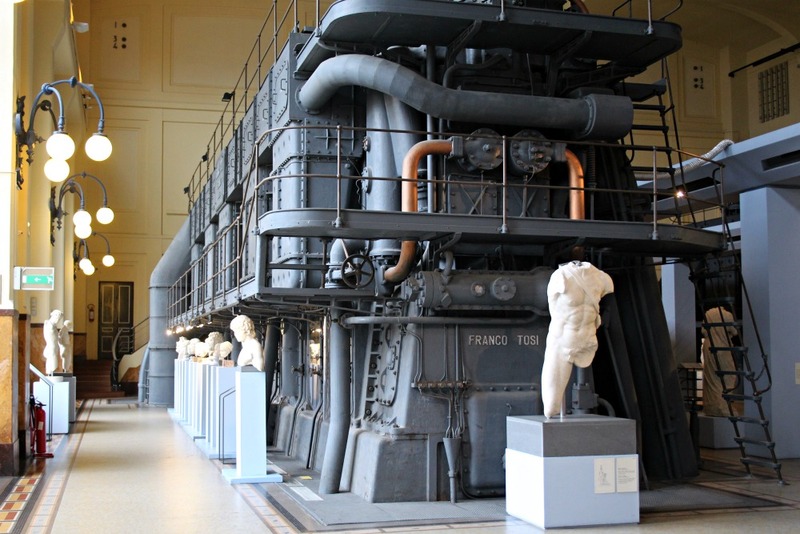 If you are in town long enough to venture out of the main tourist areas of the historic center, I recommend taking the Metro just 3 stops south from the Colosseo station (near the Colosseum) to the Garbatella station to visit Centrale Montemartini. This unique museum houses Greek and Roman sculpture in a former powerplant. I found the juxtaposition of the retired machinery and smooth curves of ancient statues captivating, making this one of my all-time favorite museums. 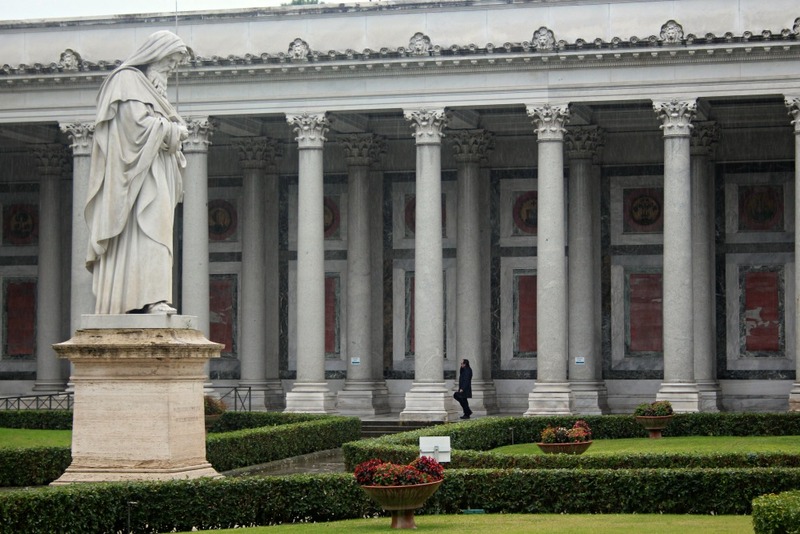 An additional 15-minute walk will take you to Basilica Papale San Paolo fuori le Mura or St. Pauls Outside the Walls. This 4th century church was built on the tomb of Saint Paul (although it was rebuilt following a fire in 1823.) In addition to the significance of housing St. Paul’s final resting place, the church contains astounding mosaics, including mosaics of every Pope since St. Peter, an intricate marble floor and a massive and ornate interior. It is, without doubt, one of the great churches of Rome. In addition to being off-the-beaten path and therefore much less crowded, many visitors note a special energy about this church. While the church itself was awe-inspiring, I loved the garden most of all. Presided over by a huge imposing statue of St. Peter, the gardens are overlooked by gorgeous mosaics on the building façade and enclosed by porticos on the remaining three sides, lending it an overwhelming sense of tranquility. Last but not least, of course when in Rome, you need to visit Vatican City or “The Vatican”. Vatican City is its own sovereign state, the residence of the Pope and the seat of the government of the Roman Catholic Church. 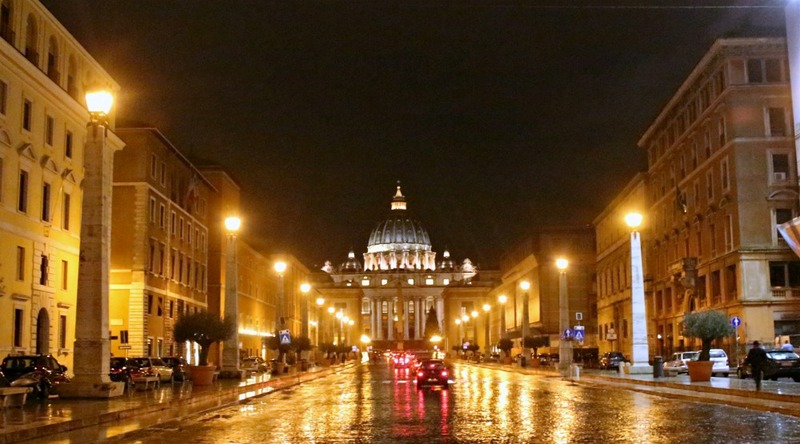 It is in general not open to tourists with the exception of St. Peter’s Basilica and the Vatican Museums. Most of the Vatican is surrounded by a wall, so there’s really only one way in – by following the Via della Conciliazione. You’ll find yourself in an expansive cobblestone plaza (the Piazza San Pietro) facing St. Peters Basilica. This huge church is impressive for its sheer scale and opulence and is also religiously quite significant. Catholic tradition holds that it is the burial site of St. Peter, the apostle and therefore considered one of the holier sites in Catholicism. Another highlight is the Vatican Museums which house an incredible array of classical and Renaissance art collected by several centuries of Popes and spread throughout 5 miles of corridors and galleries. 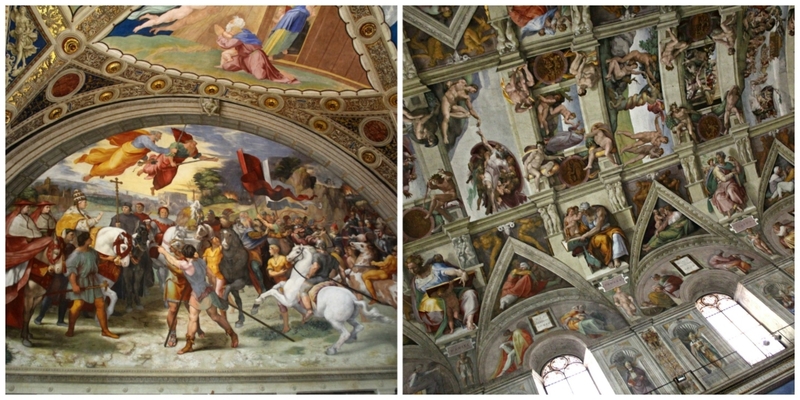 Two particularly popular attractions are the Stanze di Raffaello – four rooms of frescoes by the artist Raphael – and of course the Sistine Chapel with its famous ceiling painted by Michelangelo. It is important to know that you can’t just go to a single room in the Vatican Museums. There is a set path that winds you through the entirety of the museums, with a few optional “short-cuts”, before finally landing you in the Chapel. There is no fast way to pop in and just see the Sistine Chapel. In addition, the lines can be quite long, so it’s best to arrive early in the morning. Another beautiful piece of art not to miss is located in the Museums, but outside of the galleries. 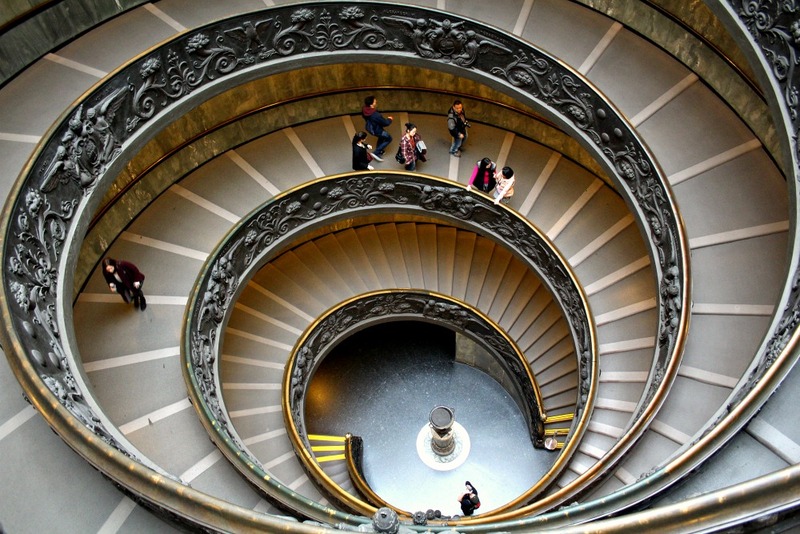 The Bramante Staircase uses a double helix design, composed of two ramps – one for ascending and one for descending – that wrap around each other but never meet. Its impressive to see and makes a great photo. There are so many more amazing sights to see in and around Rome that I could continue on here for quite some time, but these are the places we remember most fondly from our time in Rome. 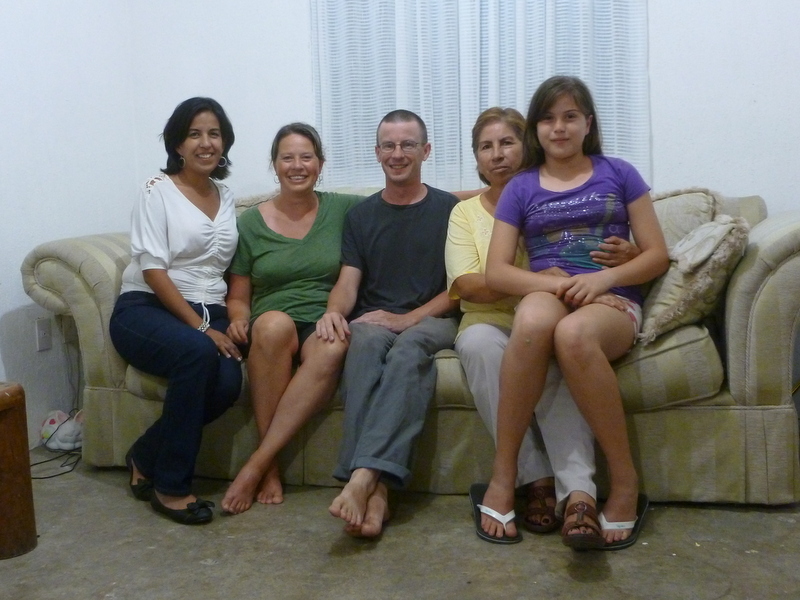 If you have any questions for us, please don’t hesitate to comment.